The Gravity FX 29 one dual suspension mountain bike is on every person’s lips because of its exclusive features. The Gravity mountain bike has become sold out in various stalls across the United States of America. The FX29 one is an impressive masterpiece, which is surely going to break into every market worldwide. Most users are expressing massive satisfaction from using the product. Its dual suspension makes it comfortable to ride be it on pavements or in the outdoor. This excellent mountain bike noted a niche in the market and filled it efficiently. Get yours today and enjoy rides across the world! This full suspension 29er mountain bike uses an advanced aluminium frame that features Cant-Beam and single pivot technology. It also has a rear adjustable coil-over cartridge with lockout and advanced suspension fork with front lockout. The wonderful bodywork makes the Gravity Mountain bike an outstanding product in the market as its body is built to last and withstand a knock or two. This gives you a well-structured bicycle with a great extent of durability. The Gravity FSX 29 One Dual Suspension Mountain Bike has powerful disc brakes and wide range Shimano Deore/ Alivio 27 speed drive train for smooth shifting on rough terrain. The plus Suntour suspension is also incorporated for further smoothness along the terrain. Advanced lockout provides maximum desired efficiency during the ride. This makes the Gravity FSX 29 One Dual Suspension Mountain Bike one of the fastest mountain bikes in the market, with the best capacity of offering you comfort and instant brakes. Gravity FSX 29 One Dual Suspension Mountain Bike comes with 27-speed Shimano shifting, as well as Cant-Beam single pivot technology, which is found in the oversized aluminium frame of the bike. In addition to that, the mountain bike has an adjustable cartridge. The world-class innovation put into this bike makes the Gravity mountain bike highly placed in the market regarding performance and stability. The level of technology invested in this bike, I can assure you will not disappoint. It is outfitted with Tetro Novella front and rear disc brakes, which ensure that the stopping power is swift and precise. This assures you of safety and preserves the integrity of your bike so that you can be riding it for years to come. It is only prudent to think that as you take your rides, you probably do not want to end up crashing into a nearby bush or person due to brakes failure. This is the bike for you! The Shimano quality is well known for its top-notch products, and that is why the Gravity FX one uses high-quality Shimano components throughout the bike. These Shimano components include a 27- speed drive train for effortless shifting, a front and rear derailleur for smooth gear changes, a cassette, brake levers and shifters. These components give Gravity FX mountain bike a boost performance wise. This is your bike! Q: What dimensions are available in the market? A: The Gravity FX 29 one dual suspension mountain bike is highly durable due to its aluminium body frame and its high quality tetro novella disc brakes, which ensures a fast and safe halt of the bike. Q: Is the item easy to assemble? A: Assembling the Gravity FX 29 one dual suspension mountain bike is very easy and takes a short time, as it is outright. The Gravity FSX 29 One Dual Suspension Mountain Bike is a mountain bike breaking market expectations. This is made possible by its superior technology, which puts it at the forefront. Its advanced aluminium frame covers all the parts of this mountain bike ensuring that it serves you for an extended period. Its tetro novella brakes disc ensures the safety of the user while riding. The fact that the bike has dual suspension equalizes both ridings on rugged and on smooth terrain, as it absorbs the shock. Though the mountain bike may require an upgrade on the rear cassette, and to use higher quality paint, the bike is top notch and is necessary to have. 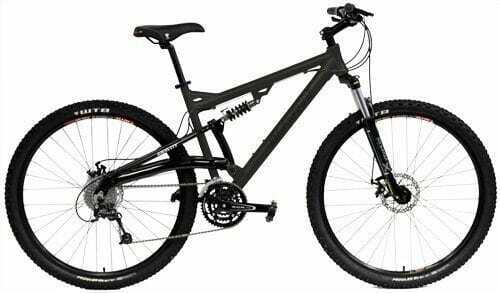 This mountain bike is under 1000 dollars and you are guaranteed quality worth your money.